Happy Tolkien Reading Day as well as happy Feast of the Annunciation. Some years back the Tolkien Society was asked if there was a day in which Tolkien fans could gather, read, and celebrate Tolkien. The day the Tolkien Society chose for this is March 25 and is known as Tolkien Reading Day (TRD). Why March 25th? It is the day that the Ring of Power in The Lord of the Rings is cast into the fiery inferno from which it was made, Mount Doom. Of all 365 days of a year, why chose March 25 instead of say, June 3rd? 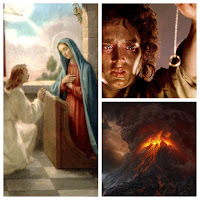 It is somewhat simple if you are familiar with Tolkien's Catholic imagery in "The Lord of the Rings." March 25 in the Catholic tradition serves as the feast of the Annunciation, the day the Angel Gabriel announced to Mary that she would bear a son by means of the Holy Spirit and he would save the world from their sins. But there is more, in early Christianity, March 25 was viewed as not only the day God the Son became incarnate, but there was also a tradition that said he also died on March 25th. That's right, Jesus was made flesh and died on the same day. This is keeping with a tradition that believed that prophets of God died on the same day they were born or conceived. In fact, many early Christian churches celebrated Christ's death on this fixed date before Easter and Good Friday became a movable feast based upon the cycles of the moon as with the Jewish Passover. What am I saying? To the Christian March 25th is the day that Lucifer is defeated by means of the incarnation and death of Christ. Likewise, the day Sauron is defeated is also March 25th when the Ring was cast into Mount Doom. One might argue that Tolkien is preparing his reader for Christ by means of a story. After all, he does write of a pre-Christian world. It would only makes sense that there are foreshadowing of Christ to be found in it like there are in other pre-Christian cultures. This was illuminating - thank you for it. March 25 - first friday, means first sunday (and first day) must have been March 20'th.